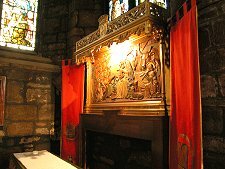 Although founded in about 1130, St Giles' central role in Edinburgh's life has subjected it to more change than seen in most churches. As a result, most of the exterior dates back to a remodelling in the years to 1833. And the interior you see today comes from a restoration completed in 1883. 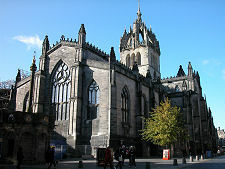 Despite its name, St Giles' Cathedral is not a cathedral. The title gives an idea of its magnificent scale, but was only strictly correct for two short periods when Bishops served in the Scottish Church, from 1633-8 and from 1661-89. A visit to St Giles' is a fascinating experience. In part this is due to its unusual layout. On the face of it you find all the elements you'd normally expect to find in a Scottish church. The western part comprises a nave, and to its east is the choir or chancel. Where the two meet is the crossing, supporting the tower, while to the north and south of the crossing are transepts. What's unexpected are the proportions of the different elements. The nave and chancel are about the same length, so the crossing and the tower are in the centre of the church rather than, as you might expect, towards its eastern end. And the transepts are no longer than the aisles of the nave and chancel are wide. This gives a very broad rectangular space in which the transepts are not particularly dominant. Although the shape and the large scale of St Giles' would suggest a great sense of space, the many rows of columns and the lower level of the vault above the crossing break up the interior, limiting the vistas and giving the sense of a series of separate but interconnected areas. 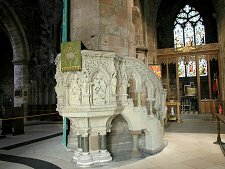 The final step in gaining an understanding of the layout of St Giles' Cathedral is in realising that since the 1980s the focus of the entire church has been under the central crossing, where you now find the Holy Table. Since then the seating in the chancel has faced to the west rather than, as you'd more normally expect and as it did before, to the east. The origins of St Giles' date back to about 1130 when a parish church was built to serve Edinburgh during the reign of King David I. 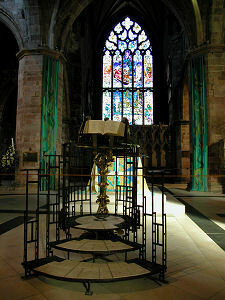 The church was originally granted to the Lazarites, and its dedication was to St Giles as the patron saint of lepers (and subsequently of Edinburgh itself). Over the years a building that probably started as a simple nave and chancel grew aisles along each side, plus transepts and a tower over the crossing. 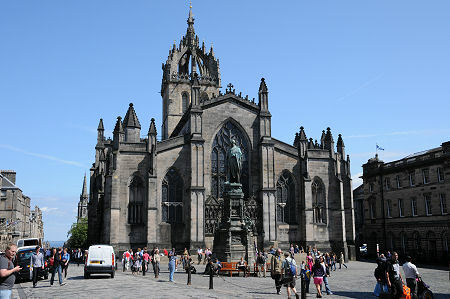 In 1385 English troops under King Richard II sacked Edinburgh and set fire to St Giles' (see our Historical Timeline). 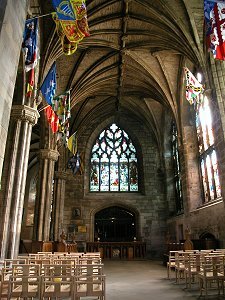 The damage was quickly made good and over the following centuries St Giles' Cathedral grew organically: an aisle added on here, a chapel there. 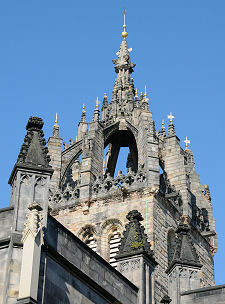 The main external change came in about 1500 when the tower was heightened and the stone crown added to its top. 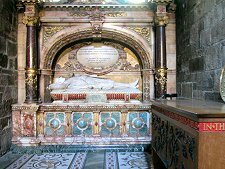 By this time St Giles had become a collegiate church, one served by a college of canons whose role was to service the many chapels and altars in the church and pray for the souls of rich patrons and their families. 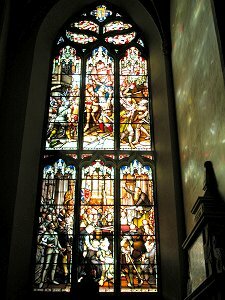 The Reformation, the storm of change that swept across the Church in Scotland in 1560, was ignited by a sermon preached in St Giles' by John Knox on 29 June 1559. Knox went on to become Minister of St Giles' and his statue now stands in the nave. By 1581 St Giles' served three different Reformed congregations, and internal walls were built to separate the areas they used. Other parts of the church were used for a variety of purposes, including storage space for Edinburgh's guillotine, the Maiden. Except during the short periods when it was formally designated a cathedral in the 1600s, St Giles' spent much of the following 250 years divided by internal walls. In 1684 the crown on top of the tower was repaired, but otherwise the late 1600s and the 1700s were a period of stagnation and decay. St Giles' second brush with history came on Sunday 23 July 1637, when a riot erupted after a street-seller called Jenny Geddes threw a stool at the Dean after he tried to use the Book of Common Prayer as newly imposed by King Charles I for use throughout his United Kingdom. This incident led directly to the Bishops' Wars, the Wars of the Covenant and the English Civil War. 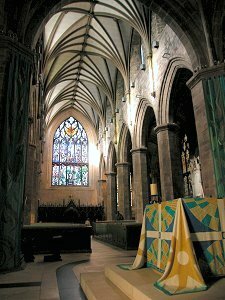 By 1800 St Giles' Cathedral was in poor condition. It had by now been divided internally to form four separate churches, plus a meeting house for the General Assembly of the Church of Scotland, a police office and a fire engine house. Externally, little of the church could be seen because the Old and New Tolbooths had been built immediately to the west, and because of a series of lock-up shops or luckenbooths built close to or actually leaning against the north side of the church. Between 1807 and 1833 St Giles' was first cleared of surrounding buildings and then given what amounted to a new exterior, during which most of the ad hoc chapels added over previous centuries were also removed. The interior space was simplified to form just three churches. It took a major restoration of the interior between 1871 and 1883 to finally removed the post-Reformation internal walls and returned the church to the more unified, if still complex, space you see today. This was largely paid for by the publisher William Chambers. Robert Louis Stevenson's 1897 observations on the area around St Giles in Edinburgh: Picturesque Notes can be read here. There were three significant changes to St Giles' in the 1900s. Between 1909 and 1911 a chapel for the Knights of the Thistle designed by Sir Robert Lorimer was added at the south east corner of the church. 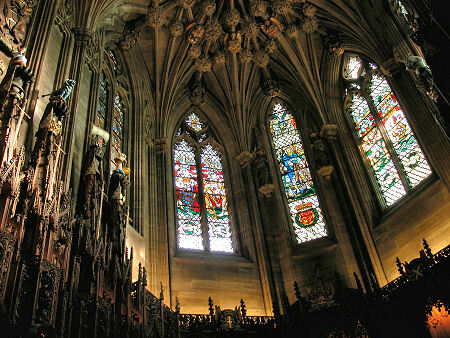 The Thistle Chapel measures just 37ft by 18ft but is extremely richly decorated. In the 1980s, the focus of St Giles' was moved from the east end of the chancel to the crossing under the tower. 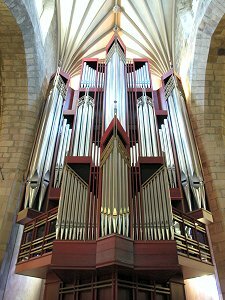 And in 1992 the truly magnificent organ occupying the south transept was installed, complete with its 4,000 pipes.